With hurricane season and other extreme weather seasons quickly approaching, now is the time to create a disaster relief plan for unexpected damages which could prevent your business from keeping its doors open – literally and figuratively. In 2017, in the wake of Hurricane Harvey and its devastation, a high-end resort was forced to temporarily close its doors. Temporary structures were a critical part of their disaster recovery plan, allowing the resort to expedite repairs. The resort is known for its amazing views, amenities, group accommodations and event facilities. Hurricane Harvey damaged all of the resort’s money-generating facilities, meaning they had to solve the issue of repairing the lodging areas and event spaces FAST. The rooms were repaired much faster than the event space. This meant even though the resort could accommodate guests, they could not provide a venue for events or conferences. 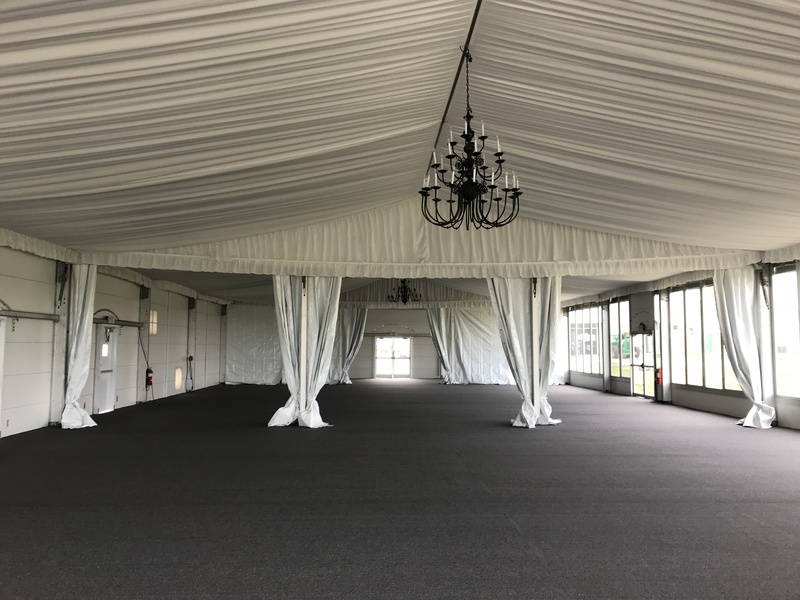 Through consultation with Mahaffey, the resort realized it could create a stunning and impressive temporary event space for guests to utilize while the permanent facilities were under construction. This meant the resort could re-open to guests without compromising any amenities. Although temporary, the event space needed to be intricate enough and designed in such way that it felt like an elegant and regal extension of the resort. Space for multiple events to be hosted at one time. HVAC to climate control against the hot humid air and other. A space creating a formal and elegant ambience. Easy accessible for guests and attendees. Space for a green room, supplies, or catering setup. The structure Mahaffey designed included one large structure with room dividers to provide the option to break into smaller event rooms or host one large event. Mahaffey designers implemented walls with large windows to allow attendees to view the beautiful port and sunsets that come with it. Front facade of all glass window units. White cloth ceiling liner for a draped permanent look. Individual chandeliers in each room. Anticipating seasonal weather, Mahaffey took initiative and installed a structure with a higher wind load capacity. With the potential of seasonal rains and thunderstorms, flooding in the structure was a risk. Mahaffey combatted this risk by installing an elevated floor and carpeting it for a more classic feel. The resort re-opened with no vacancies. 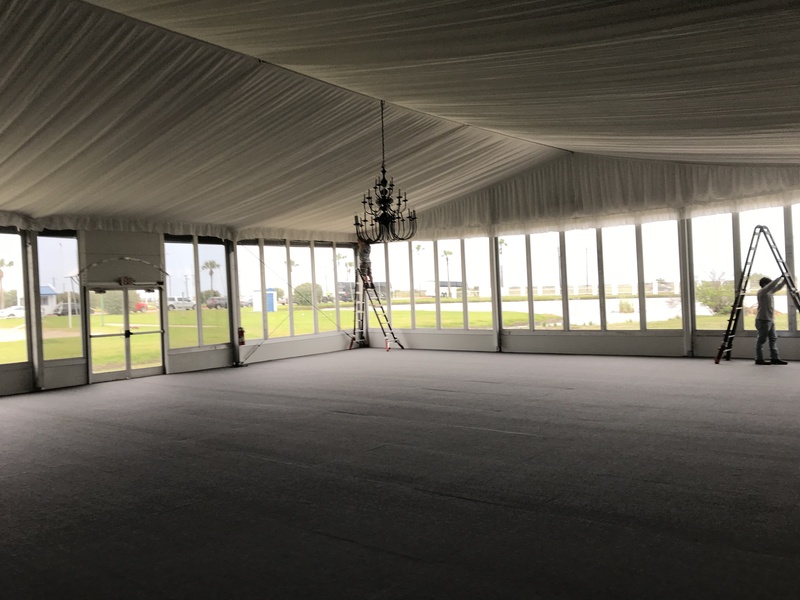 The temporary event space was completely booked, and the ongoing repairs to the permanent event space were still underway. Guests did not have to reimagine a place to host their work groups, plan their special event, or host their meeting. With the structure Mahaffey designed, the resort was able to open its doors and not compromise on amenities. You can’t plan for the weather or the damages it can do to your business, but you can have a disaster plan in place. With the right temporary structure provider and innovation, you can continue business without compromising hospitality. Mahaffey is an expert in disaster relief and providing turnkey solutions to our clients. You can always expect excellence from our team, from design to installation and finally dismantle and removal. The next time you get hit with the unexpected, reach out to Mahaffey. 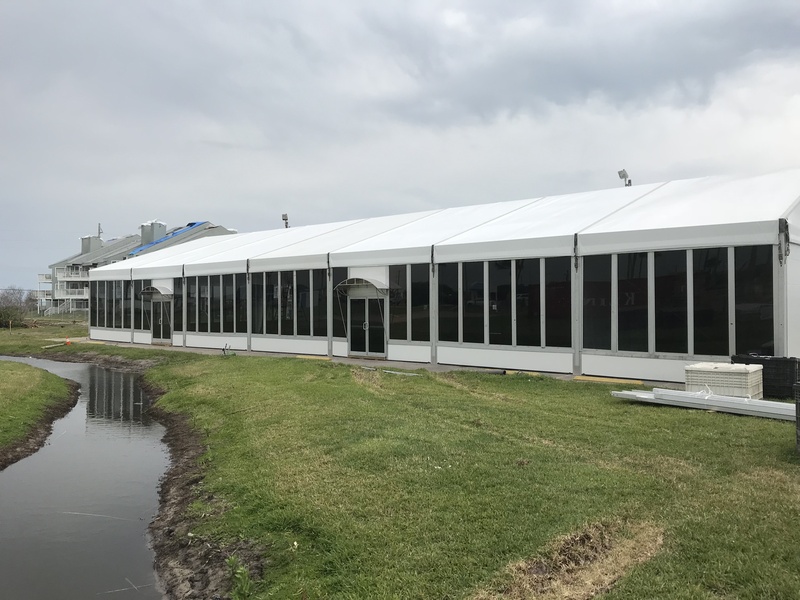 Call us today to learn more about how Mahaffey Temporary Structures can partner with you for extreme weather planning.